Now that you're the undisputed Pokémon League champion, it's time to capture the experimental Pokémon known as Mewtwo. If you select Continue after the credits roll, you'll pick up where you left off, with all of your Pokémon intact. Go back to Route #24, just north of Cerulean City. Dive into the water and Surf south until you reach a cave. Mewtwo is in there, on the lowest level. The game's not over quite yet. After the ending, the game will automatically be saved. Load it up any time afterwards and you'll find yourself where it all began, at your home in Pallet Town. Nothing has changed anywhere in the world, except for one small detail. 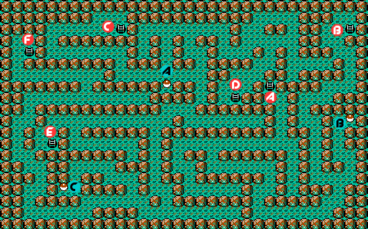 The guy standing outside of the cave right outside of Route #4 is gone, and you can now enter the game's final dungeon. To get there, you'll need to go up to Route #24 and Surf to the south, or just go up to Nugget Bridge and Surf on the river beside it and go west. The only real treasure in this cave is Mewtwo, the Pokémon that awaits at the end, a la Zapdos, Articuno, and Moltres. It's even harder to catch than those three, though, so hit a Poké Center first and get out that Master Ball. In addition to Mewtwo, the Unknown Dungeon is one last opportunity to catch some rare Pokémon and fill up your Poké-Dex. You can get Pokémon that were previously only available in the Safari Zone. like Chansey and Rhyhorn, as well as evolved forms of more common Pokémon. The dungeon's layout differs drastically between the Red/Blue and Yellow game paks, so both maps are presented here. Getting to the end is easier in Red/Blue, where you can go straight to point E, then to F and G. Yellow players will need to hit each and every ladder from A to G in order. 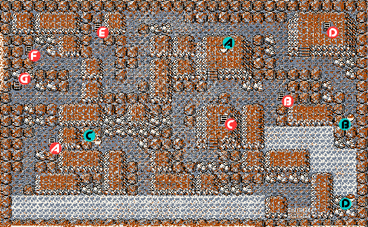 In Red/Blue there is a hidden Rare Candy on the differently colored rock next to ladder D on the 1st floor. 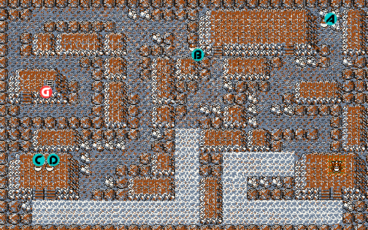 There is also a hidden Ultra Ball on the differently colored rock in the top-right corner of Basement 1. 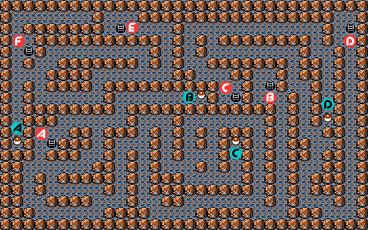 In Yellow there are hidden PP UPs by every "lonely rock" on 2nd (close to pokeball C) and 1st floor (Close to ladder C). 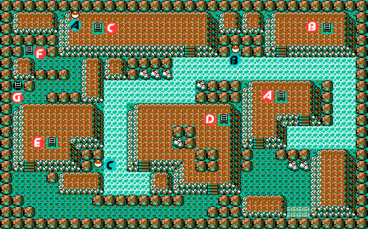 To reach Mewtwo, use the maps to follow the ladders back and forth between the levels. 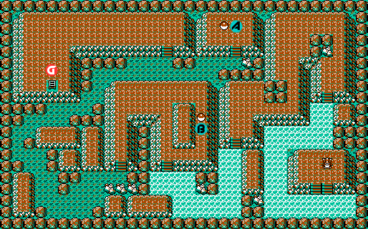 Follow the ladders in order from A to G. Once you reach the lowest level, go to the bottom-right corner to find Mewtwo. The only guaranteed way to capture Mewtwo is to use the Master Ball you received from the president of Silph Co. If you have the Master Ball don't bother fighting; just use it right away. If you don't have the Master Ball, you'll have to snare Mewtwo the old-fashioned way. Not only is Mewtwo the strongest Pokémon in the game, but it starts at level 70. So if you're trying to catch it with Ultra Balls, the experience will make catching Zapdos seem like a picnic by comparison. You can whittle it down with power techniques like Thunder and Blizzard, but it might just Recover all that health back. It's weak to Bug attacks, but most Bug Pokémon don't actually learn any Bug attacks beyond Leech Life. Beedrill and Jolteon both learn Pin Missile, which is pretty good, but Mewtwo's Psychic attack will lay waste to just about any Pokémon except for other Psychics. It's a tough fight, but it won't matter if you still have that Master Ball… Just toss it on turn one and start thinking of nicknames for your new pet. The easiest way to get Mewtwo without a Master Ball is to attack it with Articuno's Blizzard and Ice Beam until you freeze him. Because Mewtwo cannot change out of frozen status until you attack him with fire or use Haze, it should be extremely easy to catch. Mewtwo is simply the best Pokémon in the game with phenomenal stats in every category. This page was last edited on 6 March 2015, at 01:24. This page has been accessed 728,144 times.